Experts have been heavily discussing why exactly electrically insulating materials insulate as they do. Based on different mechanisms, a classification scheme for insulators has been in use since the 1960s – a theoretical one. However, it has been yet impossible to distinctly classify all insulators due to a lack of suitable experimental approaches. A team of physicists from Kiel University (Germany) and the University of Colorado in Boulder (USA) has now developed a new method to distinguish different insulators unambiguously. The study was published in the online journal Nature Communications. No notebook, no cell phone, no digital camera would be functional without electrical insulators. The hunt for precise knowledge about state-of-the-art or future insulators is just as rapid as the development of new, better electronic devices. For this reason, insulator research is currently one of the hottest topics in solid-state science. Following the common scientific procedures in physics, such insulators are first described using universal equations and simulated by computer models. The theoretical results about materials then need to be verified by experiments in the lab. It is this experimental verification that failed for a number of insulators in the past. „For many years, expert discussions went round and round without any final answer about the insulator class“, says project leader Kai Rossnagel from the Institute of Experimental and Applied Physics of Kiel University. The study presented now provides a completely new experimental approach to classifying the insulating behavior of materials objectively. The science team made use of a special effect: some electrical conductors turn into insulators when strongly cooled down. At the same time, their electric state changes, and when the materials warm up again, their electronic properties also change. The scientists now use the speed of this change to distinguish different classes of insulators. Inconceivably small time scales are applied in this method: For the classification, they use a laser beam camera to produce a film from individual images taken within femtoseconds. For comparison: If you took one picture every femtosecond for a period of one second, you would end up with 1.000.000.000.000.000 single pictures, while a regular film camera takes only 24 images per second. „The electronic changes visible in the film, take about one to 50 femtoseconds for some materials and 100 to 200 femtoseconds for others“, Rossnagel explains. In this manner, the scientists can distinguish one insulator class from another. One of the heavily discussed insulator materials, titanium diselenide (TiSe2), was now precisely classified. On top of the precise classification of TiSe2, the scientists gave the first experimental evidence for a new class of insulators, the so-called excitonic insulators. „We believe that our results may terminate the discussion about titanium diselenide after decades“; says Rossnagel but admits: „Only after several years of cross-checking our results, we will know for sure if our method is as useful as we think now“. The new classification method uses a camera technique presented by the same team of researchers in the journal Nature in March 2011. It is called „femtosecond time-resolved photoelectron spectroscopy with extreme UV radiation“. The current study was the first systematic application of the new camera technique to a scientific question. The study was carried out within the Kiel Nano and Surface Science, one out of four major research themes at Kiel University. It was funded on the German side by the German Federal Ministry for Education and Research (BMBF). 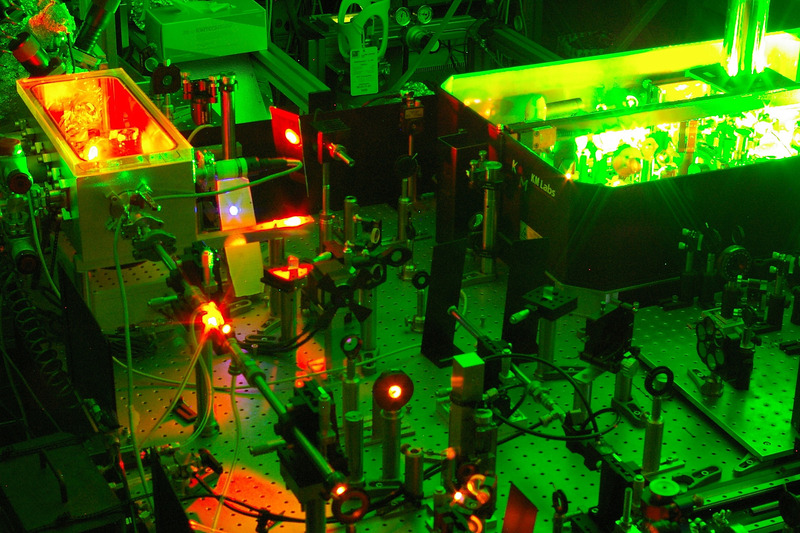 Caption: Laser system for generating ultra short x-ray pulses used in the experiment to make the recordings. Copyright: CAU, Photo: Rohwer et al. 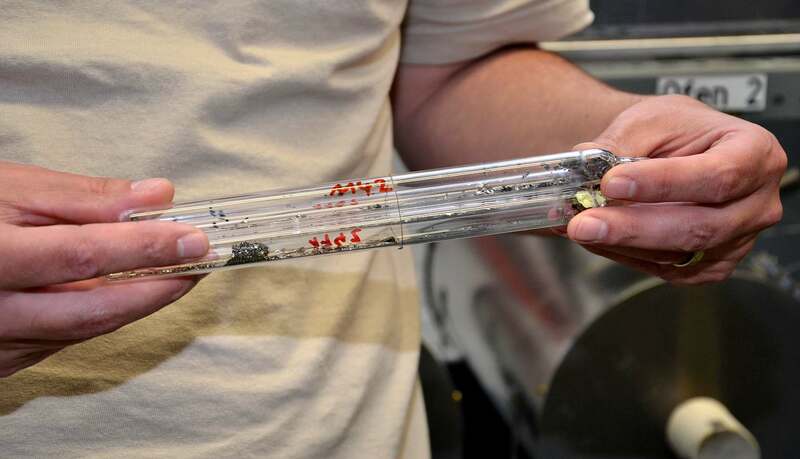 Caption: The materials used in the insulator study were produced by the scientists in a crystal breeding lab in Kiel.